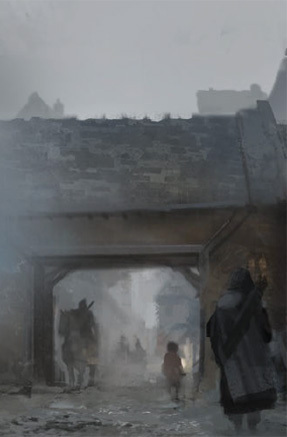 While the Contacts Trait appears in the Symbaroum Core Book as a Trait, generally associated with the player’s choice of race for their character, in the Player’s Handbook is appears as an Advantage, meaning for 5 Experience anyone can have it. From the perspective of the expanding campaign, that’s a good thing. While you can include references to organisations as mere colour in your character’s background, taking the Trait (or Advantage) adds a layer of potential. With specified Contacts, you have the means to leverage your associations in advancing the story on many levels. The Core Book contains many groups and organisations, while Thistle Hold: Wrath of the Warden expands them even further. The Contact Trait warrants a little thought and consideration to make the best use of the resources so kindly offered by the Järnringen team. While on first reading you might take Contacts to indicate that a character belongs to a group – like the Church of Prios or the Ordo Magica – and therefore can draw on their influence and assistance. However, it’s reasonable to believe that a character might have acquired Contacts through a more distant or tangential association, something subtle, associated with family, support groups, blood promises, tradition, accident or otherwise. You might not actually have been a member of a criminal organisation, for example, but had sufficient dealings with their membership to know how to get in touch. Your brother and father might have been soldiers and the circles you mixed with gave you friendships and influence in the military. Tradition in your village might have meant regular offerings to the witches of the local clan or lacking a doctor, a free colony might have depends on their for births, cures and wards against harm. There’s a touch of ethnology about this approach, meaning you could have, say, a more scholarly character who has spent time in deep study and exposure to a more questionable organisation – working alongside barbarian clans or the Witches. The Contract Trait provides a short list of organisations, but in creating a character – or building up a setting – you should look to expand that list through natural growth over time. If you’re creating a variant of the setting or seeking to focus on an area, as a GM you should append your own organisations to that list to provide players with more colour in creating their characters. If you want them to have contacts with certain people or groups, don’t be backwards in coming forward about it – put them front and centre as options. On the other side of the table, if you want the element of a character’s background that mentions a group to be more pivotal and influential than a mere acquaintance, Contacts is the right way to do it. While the core books and adventure contain references to plenty of small groups, sects and larger bodies, you shouldn’t confine yourself. As a player, you should put forward your ideas to the rest of the group or discuss them with the GM. It’s possible that in certain games all characters could be part of the same organisation or just one character might have secret affiliations that only the GM knows about – or might even have suggested. The Red Feathers could be the former – as a criminal organisation open to all manner of ’employees’ – while The First Sun would certainly be the latter. The streets of Thistle Hold might be mean, but the cellars and basements can be meaner still – many shady activities and pastimes pass by as unknowing residents and travellers tread the streets above. For those who cannot afford the entertainments of the great gladiatorial theatres, the cellars of some taverns and dives offer bare-knuckle bouts, caged fights and beast fights. For The Red Feathers, their reputation started here, in the cockfights beneath drinking holes like The Jackel Crown’d and The Pallid Goblin. The Feathers started with fights, then bets, followed by loans, protection and finally, financing ventures like expeditions into Davokar. Once handlers of foul-tempered cockerels, they have since become part of the grey establishment within the Hold, vying for control of streets, neighbourhoods and trade spaces. In a place like Thistle Hold, they have garnered enough favours and influence to furnish those they trust with what they need, when they need it – providing they can reach agreement on the price and nature of the return. At heart, they know about fights and fighters, those who have history and those with potential, and they’re willing to put money down with those willing to offer their soul in return should the venture not end well. Magic serves only as an excuse for weakness, a faith filled with holes and corked up with the wads and rods of politics and heresy. The Church of Prios has grown fat and fetid, steeped in debauchery and rank with magecraft under the guise of belief and subservience to the great god of the Sun. Those with pure faith know not the cloying and corrupting odour of sorcery, for down that path lies nothing but darkness. The Church and the Ordo Magica lead this nation back toward the very ruin that it escaped in the south, and with them, they drag the Queen and her sycophants. The First Sun casts off the befouling mantles of magic and formula, finds truth and faith in the spoken word and not bound in text enshrouded in pallid flaps of decaying flesh. The word of Prios shines, rings out like a bell uttered from the throats of the worthy and the beloved. The First Sun disavows the current Church, the figureheads and the curia. It burns books, destroys artefacts, reclaims sullied sites of worship and rescues the souls of lost and misguided. The First Sun preach and pray, but remain in constant motion – moving from site to site, settlement to settlement, city to city. The appeal to the masses, but confound the authorities. They number few enough that the Church discount them, but have acted with purpose and already made their mark. They know their way around the country and the places to hide and rest. They know the spirit of the people and how to engage their souls in the good fight. They gather rumour and loose words on relics in pursuit of their distraction… but show willing to engage with those seeking broadly common cause in finding new sites. Under the description of Contacts, with a successful roll against Persuasive, the character can call to mind a contact to provide help with a specific question or offer assistance with a precarious situation. However, the nature of the relationship might subtly test the bounds of this relationship and give the character greater potential to call in favours or set themselves up with debts. A GM might allow such use of Contacts only once per session or adventure, but should agree and set such bounds with the player when originally creating the character. Take the Heat – When a character experiences trouble or threat upon their life, they might use their Contacts to reveal unexpected reinforcements creeping out of the woodwork, a friend willing to run a distraction, or a hideaway close at hand down the alleyway just ahead that might give respite – and cool the trail. Flashback – While the Contacts trait suggests the character might get immediate information or assistance, there’s no reason why you can’t use the association retroactively. As a player, you could make a claim on your Contact and play out a meeting previously unseen or an exchange of assistance planned in advance. When the characters arrive at a travelling stop on their journey, a slip of paper might await a character from an associate in the Queen’s Rangers or after a companion becomes poisoned in an encounter, a callback to preparation might provide an account of a brief visit to Master Trelios to secure a small pouch of Riuss Leaf – which he assured you would be useful to combat certain toxins common to serpents in the area of Davokar you intend to visit. Such uses of Contacts would certainly need prior agreement and might even warrant negotiation and a debt, but they draw on and add to the flavours and potential of a relationship. The associate you ask from now could come back at any time and call in that debt – and given the company they keep, you almost certainly won’t have the option to say no (and the GM will get the chance to throw the characters into the foulest of adventures).